Lightly brush grill grates with avocado oil. Preheat grill to medium-high heat. Place 4 wooden skewers in water for 10 minutes. Liberally sprinkle shrimp with spice mixture. Thread 3 to 4 shrimp onto each skewer. Grill for 3-4 minutes per side or until shrimp is pink and cooked through. 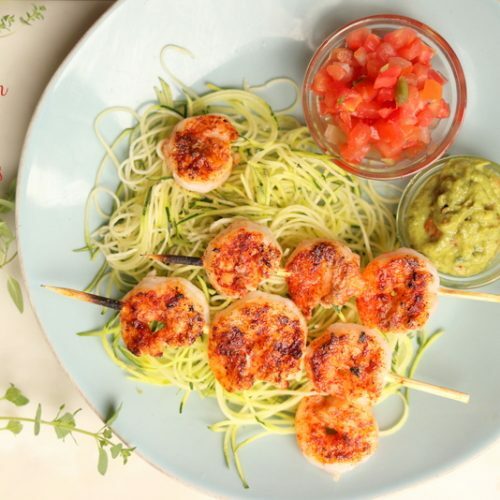 Remove from grill and serve each skewer with pico de gallo or salsa and guacamole. Serve over zoodles if desired.